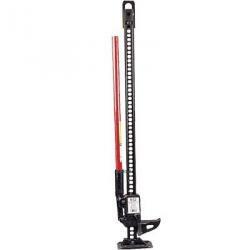 The Hi-Lift Jack is a rugged, highly versatile jack that puts you in command of situations Approximate weight: 30lbs (14 kg) 4,660 lbs (2113.74 kg) rated capacity Climbing pins of specially processed steel with 125,000 PSI tensile strength and 100,000 PSI yield. Steel bar is manufactured of specially rolled extra high carbon steel with 80,000 pound minimum tensile & carbon .69 to .82. Steel handle of 14gauge high-yield structural tubing with minimum yield of 55,000 PSI. 1 5/16" diameter x 30" long.